In the past few years I've done a post that shows my personal favorites of the past year, and I'm continuing that tradition today. If you'd like more information about a card, just click on it and it will take you back to the original post where it first appeared. So, not much has changed. I am still a flower girl, as you can see, and I love color! I'd love to know which one is your favorite. I want to thank all of you who visit me on a regular basis and leave such uplifting comments; they truly do keep me going! Here's to a creative, healthy, and happy 2015 for all of us! 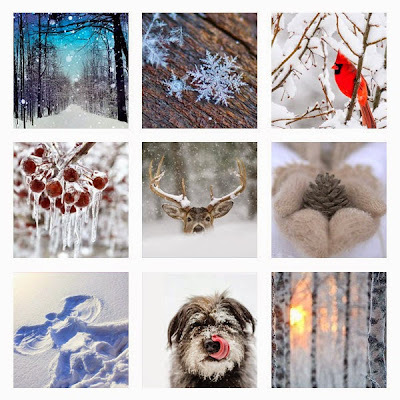 Welcome to our last challenge of 2014 at the Simon Says Stamp Wednesday Challenge Blog! This week's challenge will last 2 weeks, so that we can all enjoy the Holidays.....we wish you a very Merry Christmas and a Happy New Year! We'll see you back here in 2015! We'll go out with your favorite challenge, Anything Goes! The design team are using products made by Docrafts, and if you have anything from them, we'd love to see you sharing it with us, too. I chose a pad of paper from DoCrafts called Parisienne Blue, and made 2 cards using the papers in it. For my first card I cut a variety of the papers into strips and glued them together onto a backing to use for my background. This technique is a nice way to show off all the patterns, and also to use up small scraps, when you have them. 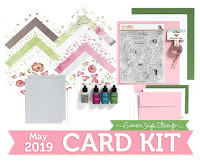 I added Memory Box Gorgeous Gardenia Outline die and a sentiment from Simon's Watt's Up? stamp set. Now it's your turn! 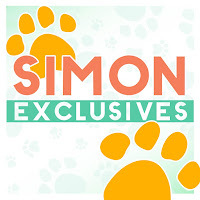 Simon Says Stamp will be giving away TWO $50.00 vouchers to the Simon Says Stamp store to 2 random winners this week! My Simon Says Stamp January 2015 Card Kit arrived yesterday and I love the mix of colors! Here's the first card I made using the elements in the kit. 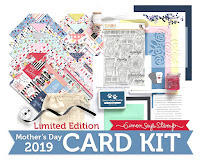 This kit is timed perfectly for after-Christmas thank you notes! I chose the chevron paper from the BoBunny design papers and trimmed out part of it, then added a Simon Eliza snowflake along with a Penny Black one and some of my own blue and clear gems. Are you ready for Christmas? Our plans are up in the air, as my 94-year old Dad is having some health problems. I'd appreciate your prayers for him and for my Mom, too. 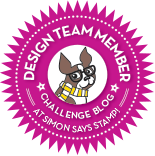 Happy Wednesday and welcome back to a new challenge at the Simon Says Stamp Wednesday Challenge! My first card uses the darling Holly Concert woodblock stamp, paired with a sentiment from Season's Wishes. The image was colored with markers, then I sponged on some tumbled glass distress ink surrounding it, and overlaid some snowflakes using Simon's Falling Snow stencil and Ranger Texture Paste. The panel was then attached to a card base made from Simon's Schoolhouse cardstock. to give to a random winner from this week's challenge. It would be a great little thing to find in your Christmas stocking, wouldn't it? Good luck! 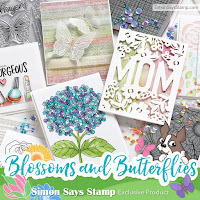 A new release at Simon Says Stamp! Today Simon is releasing their new Valentine's release called "Better Together"!! I have a card today using the new set called Heartfelt Notes. It has lots of little elements, so I pulled just 4 of them and made this card. I stamped everything in Wplus9's pretty Sweet Gelato ink. The central big heart has been fussy-cut and popped above everything else. 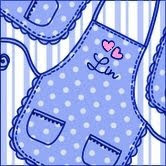 Thanks for visiting today - I hope you'll go see all of the new things at the Simon Says Stamp Blog! 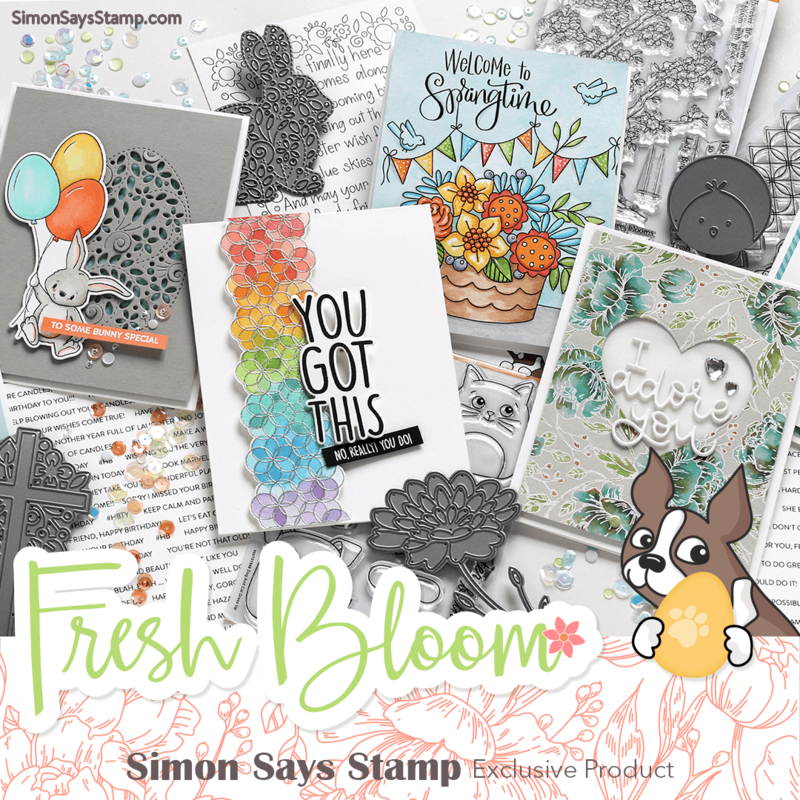 Welcome to another challenge at the Simon Says Stamp Wednesday Challenge! This week, so appropriate for the Holidays, we're asking you to Bling it On! The design team are using Kaisercraft products this week. I chose a paper pad and a stamp set and made 2 cards. There are some gorgeous papers in this pad, many of them gold-foiled like my background, but also some beautiful rich vintage designs, like the one with the bells. I fussy cut around a 2nd piece of paper and popped the bells and holly up for a little added interest. And a row of gold pearls finishes the card. For my second card, I used a stamp from Kaiser's Basecoat Christmas set, and made a little 4 1/4" square card with lots of bling! I embossed the text tree in Ranger's Super Fine Detail Gold embossing powder, then added lots of Simon's Crystal Reflections sequins anywhere that there was a dot or tiny star or snowflake on the design. The panel was popped above a panel of gold glitter cardstock, then attached to my white card base. It's your turn now! We have a $50.00 gift voucher to the amazing Simon Says Stamp store for one lucky random winner of our challenge! Just popping in to share a Christmas card. I originally made it for a challenge, but decided not to enter it. I used the very last scrap of this paper from Hero Arts Pool designer paper; I think the pretty swirls go so nicely with snowflakes! 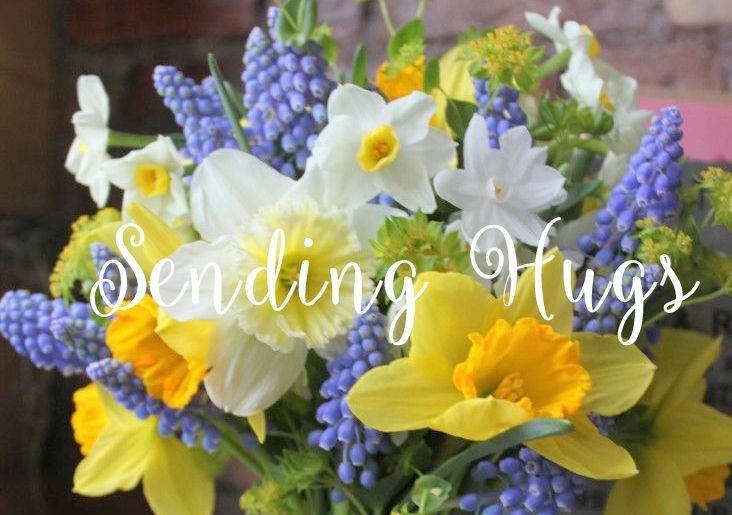 Thanks for stopping by - enjoy the rest of your weekend! 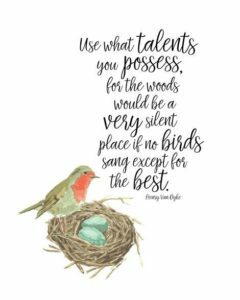 Ellen Hutson's CLASSroom is having its annual 12 Tags of Christmas with a Feminine Twist, and after seeing Jennifer McGuire's tag, I was inspired! I have had this coppery glittered reindeer for ages, recycled from a Christmas card years and years ago........and now was the time to use it! I tied some gold jingle bells around its neck with teal embroidery thread, giving this tag a fun aspect of sound when it's moved, and stamped a background (The Craft's Meow Christmas Lantern, retired) in embossed gold, adding some gold sequins for more glitz. 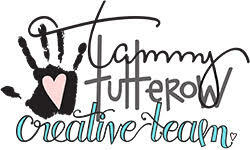 I loved Jennifer's color choices, so I followed suit, using bright pink and aqua glitter cardstock. I love using glitter cardstock, but I always forget the fits it gives me trying to get a good photograph of it! Be sure to visit the CLASSroom for lots of wonderful inspiration - there'll be a new tag every day from Dec. 1 - 12!